With Easter out of the way, we pretty much have all our new Spring Summer 2018 stock ready to go. 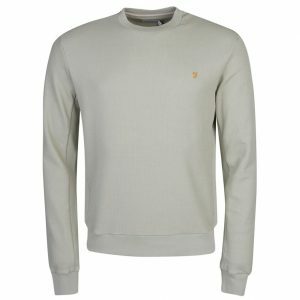 It’s a busy time of year, with two of our core brands front and centre: Lyle and Scott, and Farah. This week’s blog takes a look at the freshest new arrivals from these two famous brands. As always, we’re offering a 10% discount to online customers on all SS18 gear — just type in SPRING18 at online checkout. We don’t do a huge amount of footwear at Apache, so when a shoe leaps out at us from a brand lookbook, you can be sure it’s special. This new Lyle and Scott trainer made our jaws drop: see how the famous golden eagle logo shimmers against the off-white leather. There’s a subtle suede lining on the toe cap, tongue and heel; comfort is taken care of with a high-quality rubber sole and a padded collar. You can wear these shoes with pretty much anything — jeans, chinos or shorts, it’s up to you. Sizes range from 7 to 11 (UK). 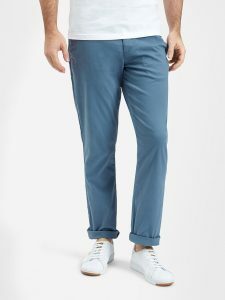 We’ve been running these classic chino trousers for some years now. Lyle and Scott stick to a simple design formula: lightweight, regular fitting, and made from a quality cotton rich fabric with a hint of stretch for added comfort. This season you can choose from three colours — Mist Blue (pictured), Stone and Navy — and sizes go in twos from 30 to 38. 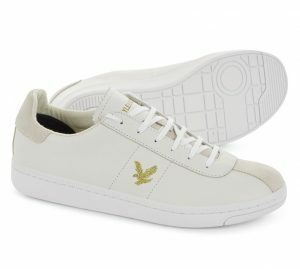 Why not wear these in tandem with the aforementioned white trainers for an unbeatable casual look. 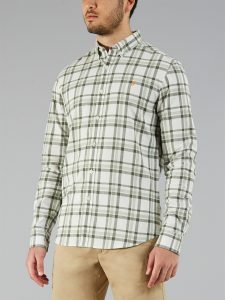 Farah have put out some fantastic check shirts since last year, and the new “Staton” shirt continues this trend. Cut in Farah’s signature semi-slim fit, this shirt boasts a soft woven cotton fabric that will keep you cool throughout the warm summer months. The Balsam green colour way is proof that you don’t always need a bold and bright check pattern to catch the eye. Sizes run from Medium to Extra Large. 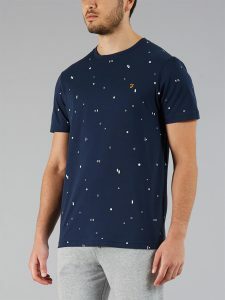 This brand new T shirt by Farah boasts a unique geometric pattern of squares, triangles and rectangles for a minimalist effect. As with all our T shirts, it’s made from quality 100% cotton, ideal for summer wear or as a base layer. Our favourite version comes in Yale (pictured), but some of you may prefer a lighter coloured Ecru. This is one of those garments that took our breath away as soon as it was sent to us. Far from a run of the mill sweatshirt, Farah have created a textured waffle fabric to add a richness and complexity to a single-colour garment. The loopback cotton interior is a real mark of quality, and has the added bonus of preventing any pesky “pilling” against a T shirt. Surely one of the best designs of Spring Summer 2018, you can choose between two superb colours: Balsam (pictured) and True Navy.